Mueller: "Once the knowledge that diesels are eco-friendly firms up in people's minds, then for me there's no reason not to buy one." GENEVA -- Volkswagen Group, whose global emissions-cheating scandal has put the future of diesel engines in doubt, expects consumers to return to the embattled technology -- and soon. 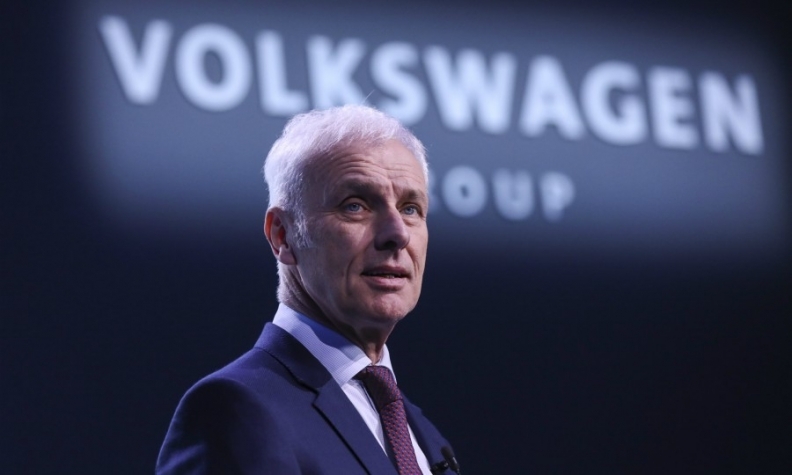 "Diesel will see a renaissance in the not-too-distant future because people who drove diesels will realize that it was a very comfortable drive concept," VW Group CEO Matthias Mueller told journalists Monday on the eve of the auto show here. "Once the knowledge that diesels are eco-friendly firms up in people's minds, then for me there's no reason not to buy one," Mueller added. His comments are bold considering that Volkswagen has put aside about $30 billion in provisions to cover fines, retrofits and legal costs stemming from the company using diesel-emissions systems that duped governments' car-pollution tests. The fallout from VW's diesel scandal has been wide ranging. Germany is now considering potential bans of diesel vehicles from cities and governments including China, France and the UK have put in place plans to phase out the internal combustion engine. Consumers have also begun to shun diesel, with its share of German car sales tumbling to a third from half since VW’s cheating scandal. In contrast to Volkswagen’s upbeat prognosis for a rebound, Toyota is getting rid of diesel versions of its cars this year, offering only two hybrids and one turbocharged gasoline engine in its redesigned Auris compact model. Ford Motor still backs diesel but sees it disappearing in some segments, according to Steven Armstrong, chief of the automaker’s European operations. “We still see a future for diesel, although on some smaller vehicles I do believe it will progressively disappear,” Armstrong said in an interview with Bloomberg Television. “We have to work hard to gain consumer trust to make sure they believe the messaging” that diesel is clean. European carmakers are keen to stick with diesel as an effective and profitable way to meet regulatory demands to cut carbon dioxide output until demand for zero-emissions electric cars takes off. German manufacturers are particularly exposed because of they generally make larger more powerful models. Automakers in the EU need to lower fleet emissions to average 95 grams of CO2 per kilometer by 2020-2021. Meeting those goals has gotten tougher as demand for diesel cars -- which emit about a fifth less CO2 compared to equivalent gasoline vehicles -- has slumped amid consumer worries about city center driving bans. Daimler, the maker of Mercedes-Benz, has said its CO2 fleet emissions rose last year, as buyers opted for larger cars. While diesel's market share has been dropping in Europe as buyers switch to other powertrains, primarily gasoline, Mueller is predicting a comeback. "The rules of the game in the EU in relation to climate protection and emissions goals on CO2 are so challenging that governments cannot do without diesel," he said. Volkswagen pledged last year to spend more than 34 billion euros ($42 billion) through 2022 to develop battery-power and autonomous-driving technology, and it has plans to create electric versions of all 300 cars, trucks and buses sold by its dozen brands by the end of the next decade. "We need diesel to get to the CO2 goals," Herbert Diess, who heads Volkswagen's namesake brand, said after presenting the fullk-electric I.D. Vizzion concept car that's capable of driving as far as 650 km (404 miles) on a single charge. "Electric vehicles in many cases won't keep frequent drivers happy." Volkswagen won't miss the targets the EU has set, Mueller told reporters. "We are doing everything to avoid" coming up short, he said. "If there is less diesel, then getting to that goal just gets tougher."